A large consignment of arms, being smuggled from Ghana to the United States has been intercepted in Spain, the Spanish Civil Guard said on Thursday. According to the law enforcement agency, the cargo was intercepted by customs officers in the southern Spanish port town of Algeciras, in the Cadiz province. "The intercepted consignment consisted of 737 assault rifles of 5.56 mm calibre and 72 grenade launchers," the Civil Guard said in a statement. 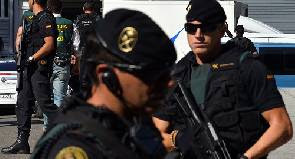 The legal documents accompanying the cargo stated that there were dismantled weapons, which the Spanish authorities established was not the true content and referred the case to court, the Civil Guard said.